We’ve always been big fans of how much our friends at Veuve support design! And we love origami! This year at the Salone del Mobile, during Veuve Clicquot’s Milan Yellow Week, the company will debut their latest design collaboration, Clicq’Up, an origami inspired design object by Belgian designer Mathias van de Walle. 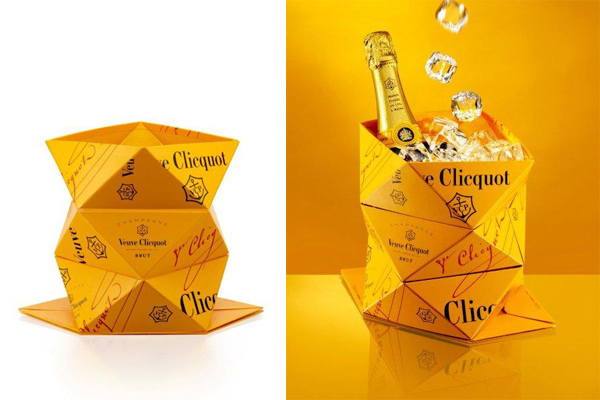 Clicq’Up is the first foldable Champagne bucket and is based on a concept of origami on ice, marrying form and function to create a contemporary, reusable design object that can be folded for easy transportation, set up, and storage. Ultimately, van de Walle’s design creates a playful home for the iconic sleek Yellow Label bottle. See how it unfolds on the next page! But with my manual dexterity, it’ll be as big a boondogle as trying to fold a map!